The BR Walls Project unveiled its newest mural last week, but this time things are a little different. 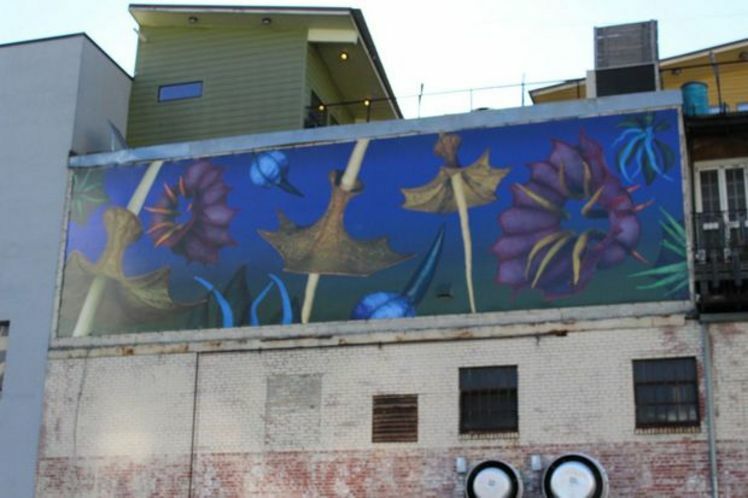 As opposed to the first murals in the project that aims to beautify downtown Baton Rouge with original artworks, the new murals won't be permanent. "(BR Walls Project organizers) were really sensitive to the fact that a building owner might not be ready to take the plunge, so Lamar stepped in and digitally reproduced the art work," said Allie McAlpin, the marketing communications director for Lamar Advertising Company. Lamar stepped in as a major sponsor of the BR Walls Project's second phase. Artist Anne Boudreau created the original work from which Lamar reproduced the vinyl copy. McAlpin said BR Walls and Lamar plan for six total installations, which will all be temporary. The first wall, which is located behind Boudreaux & Thibodeaux's on Third Street but is visible from Fourth Street, is made of vinyl and is attached with springs every 18 inches. "Mapp Construction helped with the installation … (They) have been amazing," McAlpin said. The next mural will be paper and attached with wheat paste, which turns the paper into a kind of temporary sticker. An example of this wheat paste sticker can be seen on the Inside Out Project mural on Government Street. As for where the next mural would show up, McAlpin wouldn't say. "Another installation is planned for (March), but I can't disclose the details," McAlpin said. "It's the sort of element of surprise that makes it more special." Lamar Advertising Company is adding its 13th digital billboard structure in the Dayton area. Lamar Advertising Company (Nasdaq: LAMR), a leading owner and operator of outdoor advertising and logo sign displays, announces the Company’s operating results for the fourth quarter ended December 31, 2012.